BrainGate is a brain implant system developed by the bio-tech company Cyberkinetics in 2003 in conjunction with the Department of Neuroscience at Brown University. The device was designed to help those who have lost control of their limbs, or other bodily functions, such as patients with amyotrophic lateral sclerosis (ALS) or spinal cord injury. The computer chip, which is implanted into the brain , monitors brain activity in the patient and converts the intention of the user into computer commands. Cyberkinetics describes that "such applications may include novel communications interfaces for motor impaired patients, as well as the monitoring and treatment of certain diseases which manifest themselves in patterns of brain activity, such as epilepsy and depression." Currently the chip uses 100 hair-thin electrodes that sense the electro-magnetic signature of neurons firing in specific areas of the brain, for example, the area that controls arm movement. The activities are translated into electrically charged signals and are then sent and decoded using a program, which can move either a robotic arm or a computer cursor. According to the Cyberkinetics' website, three patients have been implanted with the BrainGate system. The company has confirmed that one patient ( Matt Nagle ) has a spinal cord injury, while another has advanced ALS. The Brain Gate Neural Interface System is currently the subject of a pilot clinical trial being conducted under an Investigational Device Exemption (IDE) from the FDA. The system is designed to restore functionality for a limited, immobile group of severely motor-impaired individuals. It is expected that people using the BrainGate System will employ a personal computer as the gateway to a range of self-directed activities. 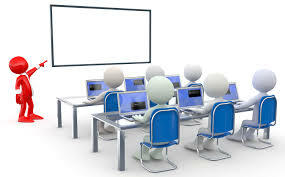 These activities may extend beyond typical computer functions (e.g., communication) to include the control of objects in the environment such as a telephone, a television and lights. The BrainGate System is based on Cyberkinetics' platform technology to sense, transmit, analyze and apply the language of neurons. 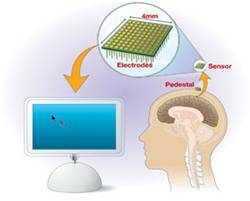 The System consists of a sensor that is implanted on the motor cortex of the brain and a device that analyzes brain signals. The principle of operation behind the BrainGate System is that with intact brain function, brain signals are generated even though they are not sent to the arms, hands and legs. The signals are interpreted and translated into cursor movements, offering the user an alternate "BrainGate pathway" to control a computer with thought, just as individuals who have the ability to move their hands use a mouse.